During the nineteenth century, Science was transformed from a hobby for leisured gentlemen to an essential influence on the lives of most people in the western world. The discoveries of physicists were lighting the cities and providing new sources of power. The chemists were transforming the look of ordinary life with inexpensive dyes and pigments, and were starting to produce useful drugs. The biologists, along with a new type of medical researcher, were transforming medicine with the theory of the cell, the discipline of physiology, and the identification of bacteria as sources of infection. New, convincing theories were being developed, heavily dependent upon mathematics, which would explain the nature of energy and the structure of matter, and make predictions that could be tested in the scientific laboratory. These obvious signs of progress caught the imagination of the public, as well they might. The public, also, felt the ferment as the reasoning methods of science were applied to more controversial topics – the origin and evolution of life, the nature of mind, and the possibility of communicating with the spirits of the dead. As the reign of Queen Victoria moved along, there was a feeling in the air that humanity was no longer at the mercy of nature, but that, through the good works of science, nature would soon be tamed for the good and progress of humanity. The ability of science to produce terrible armaments – irresistible ordnance, poisonous gas, and unimaginable bombs – would not be revealed until the wars of the next century; after that, there would be a much more uneasy and skeptical relationship between science and the public. But so far, to most people, the workings of science seemed wholly benevolent. 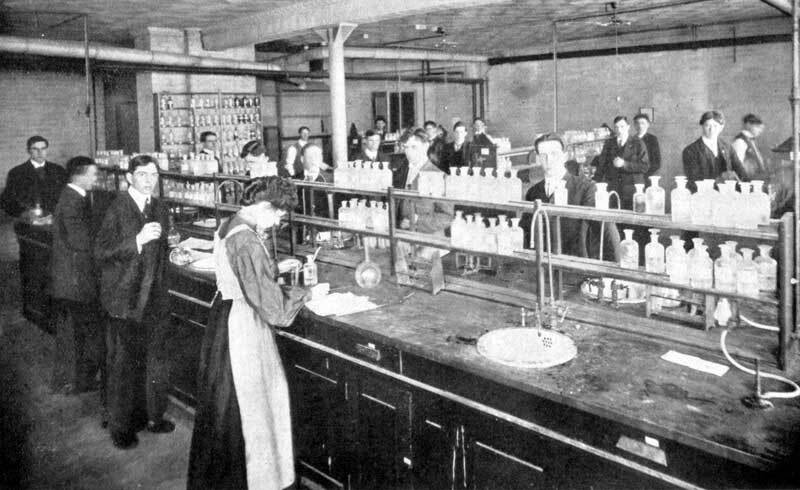 Junior chemical laboratory, circa 1909. University of Manitoba Calendar, 1909-10, page 98. Source: University of Manitoba Archives & Special Collections. The demands for science education, in the second half of the nineteenth century, came from several quarters. Industrialists were interested in inventors and engineers who would apply scientific knowledge to improve products and processes. Farmers wanted to see the benefits of science to agriculture. Physicians, conscious of how medical research had transformed the knowledge base of their profession, often felt that they should be scientists themselves. Each group was well organized and thoroughly capable of taking care of itself, and colleges of engineering, agriculture, and medicine were the solution they favoured, taking what they wished from science and hiring scientists to teach it. These feelings still exist and still contribute to the tensions within the modern university. For scientists working on the most fundamental principles, however, the physical and chemical laws that govern the behaviour of matter and energy, the values of a traditional university would make it the most nurturing place, with its ability to protect intellectual activity even in the absence of practical results. In Britain, the two old universities, full of practitioners of the old classical curriculum, were slow to accept this new challenge – Cambridge was somewhat quicker than Oxford – and some new institutions, such as Mason College at Birmingham, were founded specifically to provide higher education in science and medicine. In North America, new universities were springing up everywhere, as the continent yielded to the demands of European settlement. In the New World, there was the possibility of starting a modern scientific curriculum from scratch, if the professors could be found to teach it. As it happened, the University of Manitoba that was founded in 1877, by an Act of the Provincial Legislature, was not a completely fresh start. Three colleges already existed in Winnipeg, the results of the educational enterprise of three major Christian denominations there. The Collège Universitaire de St. Boniface, teaching in French, was the oldest, the creation of the Roman Catholics. St. John’s College, teaching in English, was next, and was owned and operated by the Anglicans. The Presbyterians had most recently founded Manitoba College. The Methodists had no college yet – their foundation, Wesley College, would not appear until 1888. Each of these three colleges had its own staff and its own course of study. The church authorities were politically powerful, generally satisfied with what they had, and unwilling simply to amalgamate when the idea of a provincial University came up. A model existed, however, by which a University could be created without compromising seriously the independence of the colleges. This was the model of the University of London, chartered in 1858, to provide a uniform standard and organization for a patchwork of colleges that had sprung up in the English metropolis during the previous thirty-five years. The University of London was an examining body only. The member colleges would continue to hire their own lecturers, enroll their own students, and teach them as they saw fit. But at the end of the course of study, there would be common University examinations in a number of subjects, and all students in the colleges would have to pass these examinations to get their degrees. This arrangement still exists. The common examinations, of course, largely determined what the courses of study would be, and much patience and cooperation was needed to get the different colleges to agree on curriculum. But the model was in place, and it was on this plan that the University of Manitoba was created by Act of the provincial legislature in 1877. Graduating class of the B.A. in Honours Natural Science, University of Manitoba, 1894. The three science instructors are in the middle - Edgar B. Kenrick (looking impatient), George Bryce (with the beard), and George J. Laird (whose unusual cap presumably reflects his Ph.D. from the University of Breslau). The names of the nine members of the graduating class are known from University records, but most names have not been attached to faces. Charles Camsell (see text) is in the second row, far left. The amateur nature of science teaching in Manitoba must have been a source of unease, particularly in a rapidly growing city like Winnipeg where new people were constantly arriving, with their wider experience of what the world was offering elsewhere. By the late 1880s it was determined that the English-speaking colleges should identify a specific group of Science instructors, with each college contributing one staff member to the team. George Bryce was Manitoba College’s contribution, teaching zoology, botany, geology and astronomy. St. John’s College recruited Edgar B. Kenrick, B.A., who taught chemistry. Kenrick had a degree from the University of Toronto,  and was also a professional analyst. The recently founded Wesley College had hired as one of its first two professors a fully trained scientist, George Jackson Laird, who had a Ph.D. in crystallography from the University of Breslau in Germany, and took responsibility for physics and mineralogy. This little faculty worked together to offer a three-year course, leading to a B.A. Honours in Natural Science, beginning in 1891. Sixty years after his graduation, a distinguished member of the first class, Charles Camsell,  recalled of his experience, “we had a little of everything and not much of anything. The age of the specialist had not yet arrived in Manitoba and I am inclined to suspect that the professor was sometimes only a day ahead of us in the subject he was teaching … One would have to have almost as much as I got in my final year to enter a science course today.”  Improvement in the quality of science teaching over what was available in Manitoba in the early 1890s was unlikely to happen without the intervention of the University itself. This was not a trivial matter, and it had been controversial for years. The University of Manitoba Act of 1877 had stated categorically that the University would conduct examinations but would not teach, leaving this to the colleges. The versions of the Act in the two official languages did not exactly coincide on this critical point. In English, it was said that the University would do no teaching “at present,” but in the French the corresponding “à present” did not occur. The omission was probably just an error that arose when the legislation was being prepared and revised, and for fourteen years it passed unnoticed. But when in 1891 the question of hiring its own faculty was broached at the University Council, Archbishop Taché, who did not wish to see his young men exposed to the teaching of non-Catholics, drew attention to the wording of the Act. At this point it was finally noticed that anglophones and francophones were not reading the same document. Winning the point that the University of Manitoba should be able to hire its own Science faculty, dealing with the political barriers that were raised to prevent this, agreeing on what subjects the new faculty should teach, and finding the money to pay them – all this took almost nine years more, with a fully satisfactory solution not reached till 1904. None of the colleges had space or equipment for teaching the laboratory component of natural science, what was called practical work. Instead, the University of Manitoba rented rooms on the top floor of the McIntyre Block, a large commercial building on the west side of Main Street, between Portage and McDermot Avenues. In this space, two large lecture rooms, a library, laboratories for physics and chemistry, and storage rooms for the scientific instruments were fitted out. The library included some of the books bequeathed to the University by Alexander Isbister  (the rest having been given to St John’s College), and $600 worth of newly purchased scientific books. All this, a botanical collection, and Laird’s personal collection of minerals, were destroyed in a spectacular fire that gutted the McIntyre Block in the cold early morning of Wednesday, February 2, 1898. The Criterion Restaurant, a number of Winnipeg’s finest retail stores, and the property of many other businesses and several private persons were also swept away. The three science instructors themselves had uninsured losses amounting to $1,500. The University’s records, in the custody of the Registrar, Isaac Pitblado, were safe at his law office elsewhere in the city. Though the McIntyre Block fire was an expensive setback, the University Council was committed to science teaching now. Two days after the fire, George Bryce informed the Council that new University space had been secured in the Davis block, on the north side of Market Street between Main and King Streets, opposite the City Hall. Lecture rooms and laboratories were quickly being fitted up, new supplies had been ordered from Chicago and elsewhere, and it was hoped to have the classes in full working order in about ten days. The rooms in the Davis block were the University’s home for a little over two years, until its own building came into service. The University Council’s main preoccupation, at the time of the McIntyre Block fire, was the question of how to finance a permanent University building. The provincial government did not give money for University buildings in those days. The only potential source for capital expenditure was the University’s considerable holding of agricultural land, scattered throughout southern Manitoba, the founding gift from the federal government in 1877. How capital should be raised using this unwieldy asset was hotly debated in Council meetings. Leasing the parcels of land to local farmers would give a steady income, but on too small a scale. Some of the land could be sold, but the more conservative Council members regarded it as an endowment for perpetuity. The solution finally adopted was to persuade the province to advance money on a mortgage of the University lands, enough to build a University building in Winnipeg for about $60,000. After a “warm discussion,”  the University Council decided in October 1898 to accept the provincial government’s offer of a site called the Old Driving Park, occupying the northeast corner of Broadway and Osborne Street, across from the Legislative Building. This site, adequate for its immediate purpose but with only a limited potential for future expansion, is where the first University of Manitoba building would be erected. The first University building, completed in 1900-01, on the Broadway site. Source: University of Manitoba Archives & Special Collections, PC80:312:11. This first University building, with permanent, purpose-built lecture and laboratory space, was a great step forward for the University of Manitoba – at last it had a home, or at least the nucleus of a home. The appointment of Bryce, Kenrick and Laird as University Lecturers was symbolically important, but it was a stopgap. Their appointments were intended to be half-time, each Lecturer receiving only $1,000 per year. All three had other duties and other income. Bryce was the minister of Knox Presbyterian church and a prolific author, Kenrick was a professional analyst, and Laird was now the University Registrar. To attract Professors, rather than Lecturers, much higher salaries would be needed. The professors would be full-time, and they would have to be very good – they were to be entrusted with great things. How would the cost be managed? Government grants, though rising, were still small, and only a portion of the necessary funds could be provided by the University’s Land Committee. The last hurdle was cleared through the efforts of the tireless George Bryce, who contacted one of the richest men of his time, Lord Strathcona, now High Commissioner for Canada in London. Strathcona is best known as the financier who made the Canadian Pacific Railway possible, and he well understood the promise of the Canadian West, and how important money was to see that promise through to success. He had helped Manitoba before, when, as Donald Smith, special envoy from the Prime Minister, he had come to Red River in 1869 to negotiate with Louis Riel. As Chancellor of McGill University, he had recently shown himself willing to contribute generously for the needs of higher education. Now, Strathcona agreed to provide $20,000 to the University of Manitoba, at a rate of $5,000 per year for four years, to be used towards the salaries of the new science professors. All three of the University Lecturers in Natural Science, George Bryce, Edgar Kenrick, and George Laird, were members of the University Council that made these appointments, and all three were present and voting (though the Minutes do not tell us how they voted, or what discussion they contributed) at the meeting of 28 July at which they were replaced by strangers. George Bryce, at least, had let it be known that he would not seek one of the new positions, pleading the pressure of his clerical duties. It was a graceful exit. Bryce would never have been offered a professorship with the amateur qualifications he had, but he was in no doubt about the value of his contribution to the teaching of science in Manitoba. In an autobiographical sketch published in 1906, Bryce noted of himself, “He introduced the teaching of science in Manitoba, and has been called the father of science in the North-West. For a number of years he has taught science under university auspices, and on the erection of the new university building, in which he took great interest, he was appointed lecturer in biology and geology and chairman of the university faculty of science.”  Bryce may well have regarded the hiring of the science professors as the culmination of his efforts for the past thirty-three years. 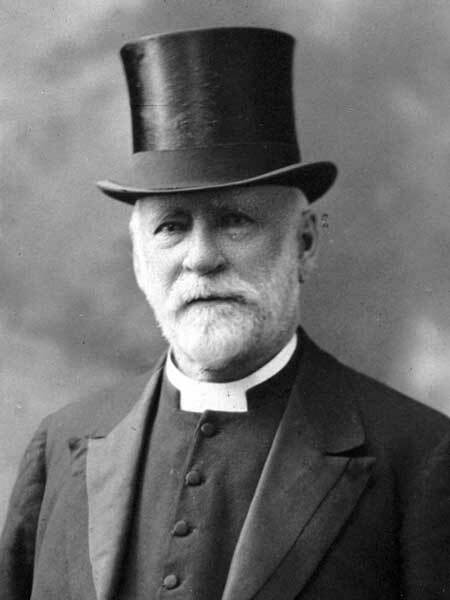 The Reverend George Bryce, August 1911. Source: Western Canada Pictorial Index, A0667-20461. 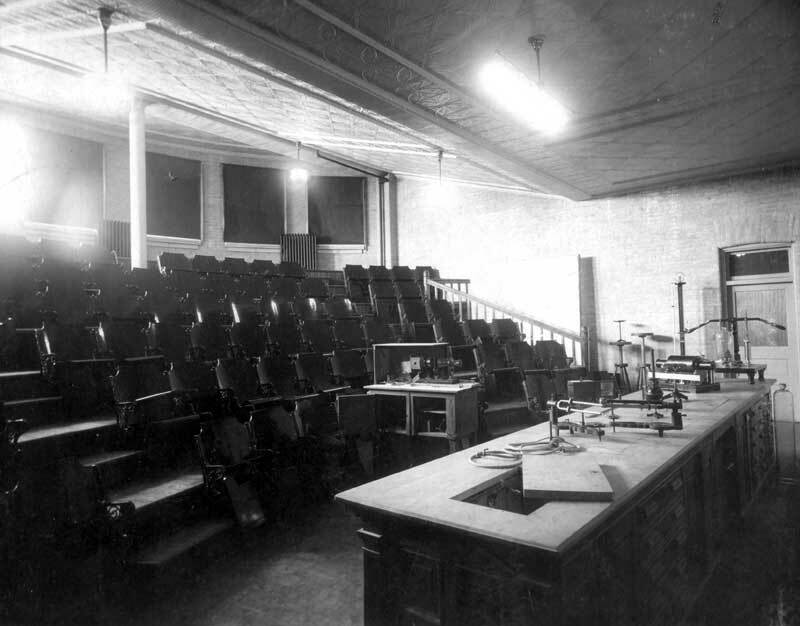 Science lecture theatre in the original University building, circa 1905, with magic lantern and apparatus. Source: University of Manitoba Archives & Special Collections, PC80:509:2. A. H. Reginald Buller, Professor of Botany and Geology, thirty years old, was the youngest of the six. He would become the most distinguished scientist among them, and perhaps the most distinguished scientist that the University of Manitoba has ever had. A younger son of a wealthy lawyer from outside the great English city of Birmingham, Buller earned a B.Sc. in 1897 from Mason College, soon to become the nucleus of the University of Birmingham. He followed this with two years’ post-graduate study at Leipzig, leading to the Ph.D. in physiological botany, two more years in research at Munich, and a year at the British Association’s marine biological station at Naples. He then returned to Birmingham as Assistant Lecturer, till the prestige of a professorship, and the call of the New World drew him to Winnipeg. His bland, unprepossessing appearance concealed a remarkable ability as a public lecturer, who could easily command the attention of a lay audience. Buller was capable of the most thorough and incisive research, particularly in mycology, the study of fungi, where he made unsurpassed contributions. A shy man, unlike his colleagues he never served on the University Council, probably preferring to make his arguments in written form. Within weeks of his arrival in Manitoba, he was already writing to the press to correct some misinformed views of evolution as expressed by Father Drummond, a member of the Committee that hired him! Original poster for the 1907 public lectures on science. B. A. (Honours) class in Natural Science, 1906, the first class to have been taught by the University professors appointed in 1904. Each graduate, and each professor, is identified by his signature. Source: University of Manitoba, Faculty of Science. Each of the six professors also made an individual report, with more detail on the courses given and students enrolled, and these begin to give insights into each man’s individual interests and concerns. All the issues that are still with the University today were raised in this and the other early reports. There were complaints of the lack of equipment and space for laboratory teaching; grave deficiencies in the library; poor attendance at classes, particularly by Arts students; the struggle of science to avoid becoming simply a handmaiden of the professional and applied interests; and lack of time for personal research. 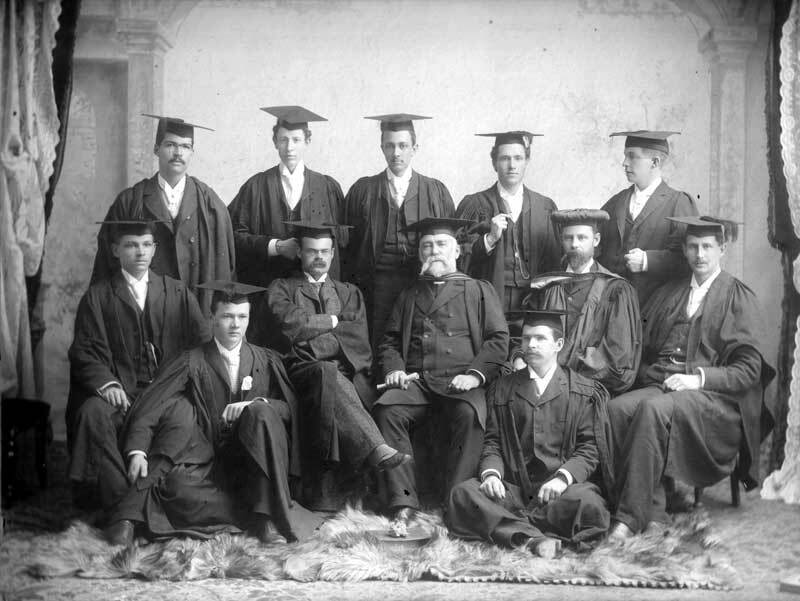 The University has a photograph of the first graduating class in Science – the first group of students to receive the B.A. in Natural Science as a result of study with the new Professors. Having taken their first year under the old regime, and the last two specialized years under the new, they graduated in 1906. There were seven of them. Thorberger Thorvaldson, who had already been working as an assistant for Matthew Parker, would have the most distinguished scientific career – joining the University of Saskatchewan in 1914, before he had finished his Ph.D., he became Head of the Chemistry Department in 1919, and finished a long career as Saskatchewan’s first Dean of Graduate Studies. Rein Van Munster worked briefly for Swale Vincent, submitted a thesis for the M.A. in 1909, and disappears from history. Percy George Bell completed medicine, was awarded the D.S.O. in the First World War, and returned to Winnipeg to practice. Robert H. Davies became a clergyman in Connecticut. The other three all survived the Great War, but their careers have not been traced. Apart from their teaching duties, and their need to do original research, the Professors of Science understood the importance of keeping the University in the public eye. 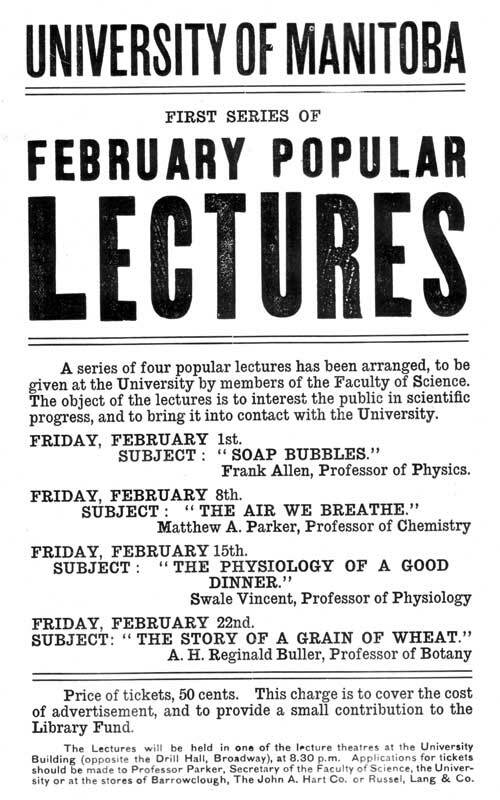 Beginning in February of 1907, they offered an annual series of public lectures in Winnipeg. Attendance was reported to be excellent, and beginning with the winter of 1911-12, the program was extended to several towns in rural Manitoba. There was also an annual Conversazione, or what we would call a University Open House, at which the public could visit the laboratories and see scientific demonstrations. Finally, an annual “Opening Address” was presented every fall, sometimes by one of the Faculty, sometimes by a visitor, through which issues of University public policy and governance were kept bubbling away. 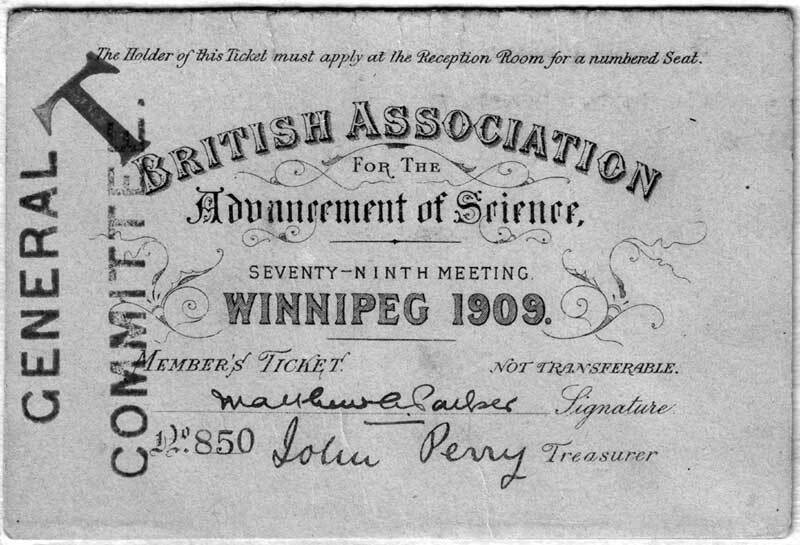 British Association for the Advancement of Science, member's ticket for the 1909 meeting in Winnipeg. Source: University of Manitoba Archives & Special Collections, Mss 9, BAAS scrapbook, opposite page 1. The most important scientific meeting ever held in the city of Winnipeg took place within five years of the beginning of the work of the University’s first science professors. The British Association for the Advancement of Science, formed in 1831, had taken for itself a mandate of promoting science in all its branches, throughout the Empire. By 1909, only three of its great annual meetings had been held outside of Britain – in Montreal (in 1884) and Toronto (in 1897), and in South Africa (in 1905). Late in 1906, the city of Winnipeg invited the British Association to hold its 1909 meeting here, and the invitation was accepted. George Bryce, who had attended the previous Canadian meetings, was put in charge of the local arrangements, and the services of Professors Parker, Buller and Vincent were quickly enlisted as Local Secretaries, responsible for arranging the details of the scientific sessions for their branches of science. Professors Cochrane, Allen, Buller, Vincent and Parker were all on a committee to arrange meeting places for the scientific sessions, and accommodation for visitors. George Bryce would be President of the Royal Society of Canada in 1909, and the prestige of the local scientists was increased by the election of both Allen and Buller to that Society in that year. The Winnipeg meeting was indeed a great success – the Mayor happily boasted that it was larger than the 1895 meeting in Toronto – and it was thoroughly covered by the local press, and by a delegation from the British papers as well. The plenary sessions, and two special lectures for the general public, were held in the largest indoor space available, the recently completed Walker Theatre, with its capacity for two thousand persons. In one of these public lectures, an English crystallographer, lecturing on “The Seven Styles of Crystal Architecture”, used a powerful polariscope to throw “rainbow visions upon the screen at the Walker Theatre”. For the city population, the star of the occasion was no scientist, but the elderly, still vigorous Lord Strathcona, who, now living in Scotland, had been persuaded to make one last visit to Canada to attend the meeting. The Winnipeg old timers lionized him, and were charmed by his reminiscences of what the city had looked like in the year of Confederation. Events organized around Strathcona’s presence greatly added to the general enthusiasm. The scientific sessions, organized in Sections according to the different branches of science, took place in the University building itself, at Wesley and Manitoba Colleges, in the Legislative building, and in two of the nearby city schools. The most exciting topics were those in atomic physics, summarized at the opening session, on the evening of 25 August, by the Association President, J. J. Thompson, the discoverer of the electron. There was a masterful review of recent advances in Physics by that now-legendary figure, Sir Ernest Rutherford, President of the Physics and Mathematics section, whose early discoveries had been made at McGill University before he was called to England. A paper on the separation of radioactive decay products by the young Otto Hahn, later to be one of the key figures in the demonstration of nuclear fission, gave hints of the direction that atomic physics was to take. The sections on Botany, Chemistry and Agriculture met together for a thorough discussion on wheat, the Prairies’ great obsession. Swale Vincent and his assistants read papers on the ductless glands, Frank Allen reported on aspects of the perception of colour, and Buller presented his new discoveries among the fungi. Parker read no paper himself, but his laboratory assistant, J. W. Shipley, contributed a report on large hailstones that had fallen during a Rocky Mountain thunderstorm. It was all received with pleasure, or at least polite attention, and recorded by the Association in a plump Annual Report, and by the newspaper reporters for the Manitoba Free Press. When they were not attending to Science, the delegates attended a grand reception at Government House, or watched polo and took tea at the St Charles Country Club (carried there in the automobiles of delighted citizens), or went on excursions to examine the wheat fields around Portage la Prairie, the quarry at Stoney Mountain, or the Lake at Winnipeg Beach. At morning service at Knox Church on the Sunday, George Bryce’s sermon, built upon the text of the 19th Psalm, sought to reassure the congregation of the intellectual compatibility of Christianity and Science. When he spoke about the neglectful treatment of the University of Manitoba by the Government of the province, Dean Wesbrook was referring to the slow progress of a Royal Commission, which had been labouring for almost two years over the question of how the University should be reorganized. In the end the Commission could not agree, and three different Reports were presented to Government by the end of 1909, of which the Government chose one that the University Council found unacceptable. There then commenced a period of eight years, which W. L. Morton, the historian of the University of Manitoba, termed “the Years of Deadlock”, during which successive provincial Governments, preoccupied with educational questions that extended far beyond the University itself, struggled with the University Council to settle the question of how the University should be managed. The episode concluded with a new University of Manitoba Act in 1917. The story is not without interest,  and the science professors were involved in aspects of it as academic politicians, but it has little to do with the development of science at Manitoba. The numbers of students in University classes were steadily increasing, and a sense of student identification with the University is shown by the establishment of a University of Manitoba Student Union in 1906, and a Science student association shortly after. With the fall of 1910, the first University professors were appointed in Arts, in the persons of Chester Martin in History and Archibald Brown Clark in Political Economy. The first Professor of English would be appointed the next year, and Professors of Classics, French, and German in 1914. The Science professors, also, finally got some significant help in 1910. Frank Allen was joined by a Lecturer, R. K. McClung. Buller’s dual responsibility for Botany and Geology was relieved with the appointment of Robert C. Wallace as Lecturer in Geology and Mineralogy (promoted to Professor in 1912). In Chemistry, a Lecturer, Henry Percy Armes, became Parker’s first colleague. Swale Vincent received the help of two new Lecturers, A. T. Cameron in Physiology and C. J. Triggerson in Zoology; Triggerson would take over Zoology completely in 1912. Most of the new Science lecturers had Ph.D.’s – several of them were promoted to the new rank of Assistant Professor in the next few years – so the depth and expertise of the Departments, as well as the teaching capacity, was substantially extended. 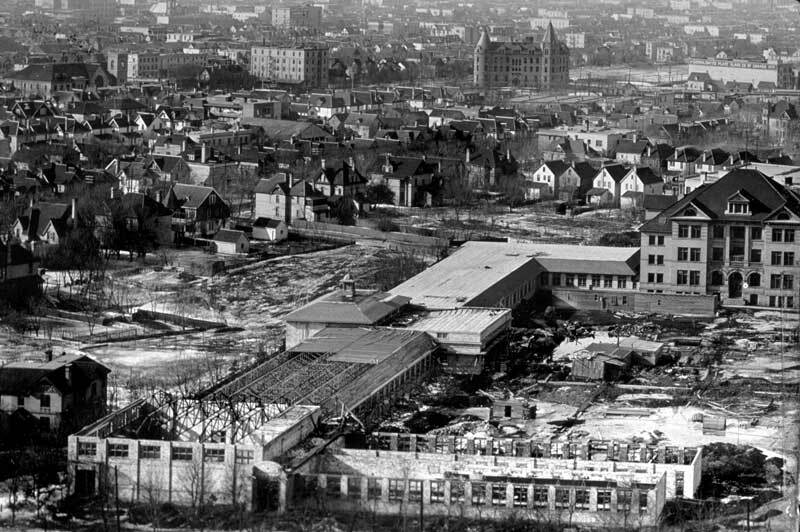 The “temporary buildings” under construction at the Broadway site, 1920. The original University building is on the right, and Wesley College (now Wesley Hall, University of Winnipeg) is prominent in the distance, just right of centre. Source: Western Canada Pictorial Index, A1291-38660. With these new staff in place, Science took a very significant step forward in 1912, when the University Council introduced a new Honours course leading to the degree Bachelor of Science. Before this, students specializing in Natural Science nevertheless received the Bachelor of Arts. The new course was a demanding one, requiring five years of study, of which the last two were heavily specialized in science. As Morton pointed out, the fact that this rigorous course was established is a sign of “the strength and prestige thus early attained by the science departments.”  The first B.Sc. degree was awarded in 1916, to Ezra Allen Thompson, who would go on to a career in the Mines Branch of the federal government. Two B.Sc.’s were awarded in 1917. One was to Urban David Clark, who had an industrial career in Toronto. Relief of the crowding was obtained partly by taking over old provincial Government buildings, such as the old Law Courts building when the judges moved to new quarters next door; and partly by an extensive complex of temporary buildings, part brick and part frame and stucco, which came into use near the end of the First World War. Not until 1929 was it finally determined that the Government would not provide money for buildings at Tuxedo, but that it would assist the University to build on the large riverside acreage beyond the southern edge of the growing city. On that site, the College of Agriculture had been established since 1912. Fine new buildings for Arts and Science (now called the Tier and Buller Buildings) were then commenced and soon occupied. 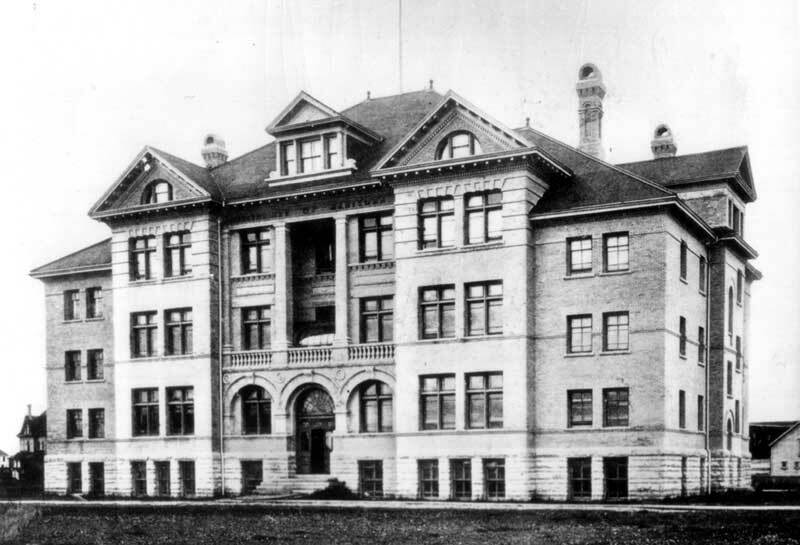 The upper years of the Arts and Science programs (the “Senior Division”), and the Science research laboratories, were moved to the Fort Garry site, while the lower years (the “Junior Division”) remained at the crowded Broadway site, which had been supplemented by further temporary buildings, until 1950. When they arrived in Winnipeg in the late summer of 1904, the new professors were keenly aware of their isolation from the rest of the scientific world. Matthew Parker later recalled how he had realized, after the death of Edgar Kenrick in January 1905, that he, Parker, was now the only chemist for a thousand miles. In the fall of their second year, Buller, Parker and Vincent sent a letter of invitation to a few individuals, proposing the formation of “a small private Scientific Club”, with a total membership of perhaps ten or twelve. “The main object of the Club would be to discuss new and current scientific questions and it is hoped that such discussion would act as a stimulus to original research on the part of the members”. Eight individuals attended the first meeting, on the evening of Tuesday, 24 October 1905. All the six professors were there, with Matthew Parker in the Chair, and there were two others, F. Torrance, from the Agriculture College, and Dr. Harvey Smith. A mechanism for electing further members was devised. It was agreed that the meetings should take place every second Tuesday evening, the program to consist largely of a scientific presentation by one of the members, followed by discussion, and biscuits with coffee. Ten more members were added during the first season, including the City Health Officer Dr. Douglas, several other physicians, and the Principal of the Agricultural College, W. J. Black. The subjects chosen for presentation were serious and indeed of current scientific interest. Buller gave the first, on “Some Recent Phases of the Evolution Theory”. Vincent followed with a talk on the Suprarenal Capsules (the adrenal glands), including “a demonstration of the action of adrenalin”. Allen was next, discussing “Theories of Colour Vision”, including some of his own research; and Parker carried on with an explanation of “Stereoisomerism”. The first season continued till the end of March 1906, omitting only the Tuesday meeting that would have fallen on Christmas Day. The usual venue for Club meetings was the Botany lecture theatre at the University, a room just the right size for the twenty-odd members who usually attended, with a small office nearby for the coffee and biscuits. The Scientific Club grew steadily – eight members were added in 1906-7, fifteen more in 1907-8, and eight more in 1908-9, at which point a temporary limit of forty was imposed on the membership list. Physicians were always happy to join, and now formed a majority; soon, the Club resolved to limit “medical men” to no more than half the membership. But all the University faculty and several of their assistants belonged, as did most of the Agriculture faculty, and a few members drawn from local industry, and from the general public. Rigorous efforts were made to ensure that all members were seriously committed to the Club – a subscription of $2.00 per year was instituted ($3.00 for those smoking) in 1907, and later a rule was imposed that members would be struck off if they missed five consecutive meetings without a good excuse. A number of less serious members resigned after these steps were taken, creating places for newcomers. No matter how sincerely professional scientists feel the need to communicate their discoveries to the world at large, there will always be some things that they can only discuss with other scientists. How strongly the members of the Scientific Club of Winnipeg valued the discussion group that they had created, and how far they would go to preserve it, was demonstrated by an exchange between the Club and George Bryce in the winter of 1908. The Manitoba Historical and Scientific Society, which Bryce had done so much to encourage over the years, was in a low period, and it was perhaps for this reason that he sent the Club a detailed proposal about how it might amalgamate with the Society. After discussion over two meetings, the Club declined the proposal by a formal motion, the result of which Swale Vincent, the Club Secretary, committed in writing to Bryce. No doubt the Club members fully understood the delicacy of the position – Bryce, the longterm friend of Science in Manitoba, could not help but be offended by this rejection of one of his other interests. But they also were aware of the danger that the intellectual intensity of their meetings would be diluted by whatever science amateurs the Society might be able to contribute. The Scientific Club’s rejection of Bryce’s proposal was a final confirmation that the age of the professional scientist had come to Manitoba. Research activity at the University was sustained through the second decade of the century, in spite of the crowding, the endless debates over University governance and a permanent site, and the draining influence of the Great War, in which many students and several faculty participated as soldiers in the Western Universities Battalion. With the War over, the good consequences of the more demanding Science curriculum began to show themselves. By the early 1920s a steady flow of completed M.Sc. theses, produced especially from the Departments of Botany, Chemistry, and Physics, testified to the students’ interest in advanced Science education, and to their ability to manage it. Buller’s international reputation was making itself felt, as students came from far away to study with him. He supervised the first Ph.D. student to graduate from the University of Manitoba, William Fielding Hanna in 1928. The Winnipeg Scientific Club fostered these new research developments in tangible form beginning in 1920, with its Club Prize of $300 (sometimes divided in two) for student research, and with the Hudson’s Bay Company Fellowships of $1,500, the result of a ten-year grant from that Company, for more advanced study by promising young scientists. Reginald Buller retired from the University of Manitoba in 1936, wanting more time for research. Matthew Parker, his sight failing, retired the next year. Frank Allen remained as Head of Physics for a total of forty years, retiring in 1944. When news of Parker’s retirement began to circulate, one of his well wishers, the President of the University of Saskatchewan, Walter Murray, noted that he had expected Parker and Allen to retire together. “You and he”, Murray wrote Parker, “are the last of the immortals who came to Manitoba University in 1904. You and your group did wonderful work in conditions which were extremely difficult.”  They did indeed. The University Council, with the province, had spent twenty-seven timid years making its way from 1877 to a rare, brave moment of decision, and the six professors they appointed then changed things forever. The timidity and indecision would continue for many years yet, and the University professors would often be frustrated by the lack of progress, but they knew their own way forward, and they took their University with them as they went. 1. In 1873, the Natural Sciences curriculum at Manitoba College was to include “Geology, Botany, Zoology and Chemistry, with the principles of Scientific Agriculture” [A. G. Bedford, The University of Winnipeg. A History of the Founding Colleges (Toronto: University of Toronto Press, 1976), p. 9, quoting General Assembly proceedings for 1872]. 2. H. E. Duckworth, personal communication. Bryce became minister of Knox Presbyterian church in Winnipeg in 1871. 3. Bryce himself is known to have made a botanical collection. An indication of what Manitobans meant by “natural science” is given by the Presidential address of Rev. W. A. Burman to the Manitoba Historical and Scientific Society in July 1900 [printed in MHS Transactions, Series 1, No. 55], entitled “The Present Status of Natural Science in Manitoba and the Northwest”, in which he discussed “Meteorology, Geology, Botany, Zoology, Ornithology and Entomology, with their several branches”. It is significant that chemistry and physics were omitted from Burman’s list, as outside his competence. 4. Of the 148 graduates from Manitoba College up to the year 1894, 35 (or 24%) did their degrees in Honours Natural Science, and five won the Governor General’s Silver Medal, then the University’s highest academic award. Of the 70 graduates from St John’s College, 10 (or 14%) had Honours Science degrees; and of the 28 from Wesley College, 2 (or 7%) had Honours Science degrees. Thus the interest in Science was higher at Manitoba College, perhaps because of Bryce’s influence, and the graduates included some of the best students. These numbers are extracted from the lists of graduates in the 1894 University of Manitoba Calendar (copy in University of Manitoba Archives). 5. Edgar Kenrick received a B.A. in 1888 from the University of Manitoba ad eundem gradum, that is, having presented evidence of adequate study elsewhere. A number of the very early degrees from the University were granted on this basis. Frank B. Kenrick (1874-1951), Edgar’s younger brother, went on to complete a Ph.D. with the famous physical chemist Ostwald at Leipzig, and returned to a successful career as Professor of Chemistry at the University of Toronto. The brothers published a research paper together in 1902 [Journal of the American Chemical Society, vol. XXIV, no. 10, October, 1902]. 6. Charles Camsell (1876-1958), a celebrated geologist and surveyor of northern Canada, served as federal Deputy Minister of Mines 1920- 46, and was President of the Royal Society of Canada in 1930-31. 7. Charles Camsell, Son of the North (Toronto: Ryerson Press, 1954), pp. 30-31. 8. For the details, see W. L. Morton. One University. A History of the University of Manitoba (McClelland & Stewart, 1957), pp. 42ff. 9. Alexander Kennedy Isbister (1822-1883), the son of a Hudson’s Bay Company clerk, born at Cumberland House, worked for the Company himself for four years, then sought higher education in Great Britain and spent the rest of his life there, accumulating a considerable estate as the writer of school texts. When his will received probate in 1883, it was discovered that the recent establishment of the University of Manitoba had caught Isbister’s imagination as a progressive thinker about education, and that he had made himself the first significant benefactor of the new University. The capital from his estate, about $83,000, became the endowment of the most important University scholarships, the Isbister Scholarships, while Isbister’s library of almost five thousand books entered the collections of St. John’s College and the University. Isbister’s bequest was the only large gift to the University of Manitoba for many years, and it was a particular tragedy that this money was lost, with other University funds, in the Machray defalcation of 1932. For a full account of Isbister see the article by H. C. Knox, Manitoba Historical Society Transactions, Ser. 3, No. 12 (1955-6), which is available online at the MHS website. This article errs in dating the discovery of the loss of University funds to 1914 rather than 1932; for the correct information see Morton (1957), pp. 148ff. The University has since made imaginative efforts to restore the Isbister endowment, but the real value of the awards today is far less than those that could be made from the original bequest. 10. For details of the McIntyre Block fire see Manitoba Morning Free Press, 3 February 1898; Winnipeg Daily Tribune, 2 February 1898; and following dates. Some historians have stated that the University records, and most of the Isbister library, were lost in the McIntyre Block fire. Important University records certainly exist from before 1898, in particular the Minute Books of the University Council, but the runs of Calendars and Proceedings of Convocation are incomplete, and were probably reconstructed after the fire. It is unclear how much of the Isbister library was housed in the McIntyre Block, but there was still an “Isbister library” in the care of the Manitoba Historical Society in April 1901, when it was transferred to the University building [Minutes of University Council, Mar 1899-Sep 1904, pp. 238-9. 11. Winnipeg Tribune, 4 February 1898. 12. Manitoba Free Press, 28 October, 10 November 1898; Winnipeg Daily Tribune, 28 October 1898. 13. Manitoba Free Press, 29 September, 11 October 1899. 14. Because the new building was not ready for the start of classes on October 1 1900, and the Science lecturers felt it important to supervise the final stages of the builder’s work, first year classes in Chemistry, and some Physics classes, were cancelled until after Christmas, when they were offered at an accelerated pace [University Council Minute Book, Mar 1899-Sep 1904, pp. 183-4]. Lectures began in the new building on 7 January 1901 [Ibid., p. 208]. 15. University Council, Minute Book, Mar 1899-Sep 1904, pp. 173-4. 16. There is a full account of the royal visit, including the opening of the University building, in the Manitoba Free Press, 27 September 1901. 17. W. J. Spence, University of Manitoba Historical Notes 1877-1917 (Winnipeg, 1918), p. 26. 18. University Council Minute Book, Mar 1899-Sep 1904, pp. 541-6 (meeting of April 7 1904), gives the details of the professorial Chairs, and how they were to be financed. 19. University Council Minute Book, Mar 1899-Sep 1904, pp. 548-9, 585- 7 (meetings of 14 April and 28 July 1904). 20. Letter, George Bryce to University Council, read by Bishop Matheson at Council meeting of 28 July 1904, as reported in Manitoba Free Press of that date. 21. In Bryce, History of Manitoba; its Resources and People (History Publishing Co., 1906), p. 691. 22. Kenrick to Buller, in Buller papers, Agriculture Canada Library [now transferred to the University of Manitoba Archives & Special Collections]. Kenrick also wrote to the University Council. The contents are unknown, but the Council voted that it simply “be received and ordered to be filed”. University Council Minute Book, Oct 1904-Dec 1909, p. 12 (meeting of 13 October 1904). 23. St John’s College had to discipline some students for twice stealing Kenrick’s bicycle [W. J. Fraser, St. John’s College, Winnipeg, 1866-1966. A History of the First Hundred Years of the College (Winnipeg: The Wallingford Press, 1966), p. 38]. Although it’s a silly incident, students as a rule do not play practical jokes on professors whom they like. 24. Winnipeg Evening Tribune, 26 & 27 January 1905; Manitoba Free Press, 27 January 1904. 25. The household of John G. and Rebecka Laird, with George and the rest of their children, is in the 1881 Census of Canada [NAC Film C- 13251, District 139-F-1, p. 34, Household 156]. Most of the other details in this paragraph are from George Laird’s obituary notices (see next footnote). 26. Bedford (1976), pp. 228, 275; and obituaries in Winnipeg Free Press and Winnipeg Tribune, 1 April 1940. Laird’s sister, Dr. Elizabeth Laird, endowed lecture series at six Canadian institutions of higher learning, one of them United College, which has since become the University of Winnipeg. 27. From an interview with Parker, in the Winnipeg Tribune, 27 March 1935. 28. Morton (1957), pp. 89, 93-4. 29. For Bell, see his obituary notice in the Winnipeg Tribune, 9 August 1923. 30. Most of this is from the obituary in the Winnipeg Tribune, 4 April 1910. Robert R. Cochrane, teacher, was living in Wellington Ward, Ottawa, at the time of the 1881 Census [NAC Film C-13229, District 105-A-1, page 11, Household 56]. He married Eva Rosetia Riley at Winnipeg, 6 April 1891, and she and four children survived him. 31. There is a copy of the marriage certificate of Matthew Parker and Elizabeth Blackie, 3 September 1904, in the Matthew Parker Fonds, University of Manitoba Archives, Mss. SC.56, Box 1, Folder 3. 32. A list of Parker’s demonstrators may be compiled from the University of Manitoba Calendars. 33. A. N. Campbell, “Matthew Parker”, Trans. Royal Society Canada, Ser. 3, vol. 49, pp. 123-5. 34. G. S. Fahrni, Prairie Surgeon (Winnipeg: Queenston House, 1976), p. 39. Fahrni’s was the first medical class at Manitoba to take the new five-year curriculum, which benefited from the new professors; he graduated with the M. D. degree in 1911. 35. H. E. Duckworth, personal communication. Dr. Duckworth took first year Chemistry from Parker in 1931-2, and Organic Chemistry from him in 1935-6. 37. Vincent was awarded an honorary degree, L.L.D., by the University at a special convocation in May 1920, just before he finally left for England. Allen, Buller and Parker all received the L.L.D. from the University in 1924. Vincent was Professor of Physiology at the Middlesex Hospital, a part of the University of London, until he retired in 1930. He died three years later [see obituary notice in Nature, 27 January 1934, pp. 128-9]. 38. Nature, 9 March 1905, p. 448. 39. There is a detailed description of this apparatus in the University Calendar for 1906-7 (copy in University of Manitoba Archives). 40. Parker interview already cited. 41. For details of the early history of the library collection see University of Manitoba Archives UA 9, Box 1, Folder 2. 42. The Report of the Winnipeg meeting, published by the British Association, contains a list of all the members, with their addresses and dates of membership, and from this the list of new Winnipeg members in 1909 can be extracted. 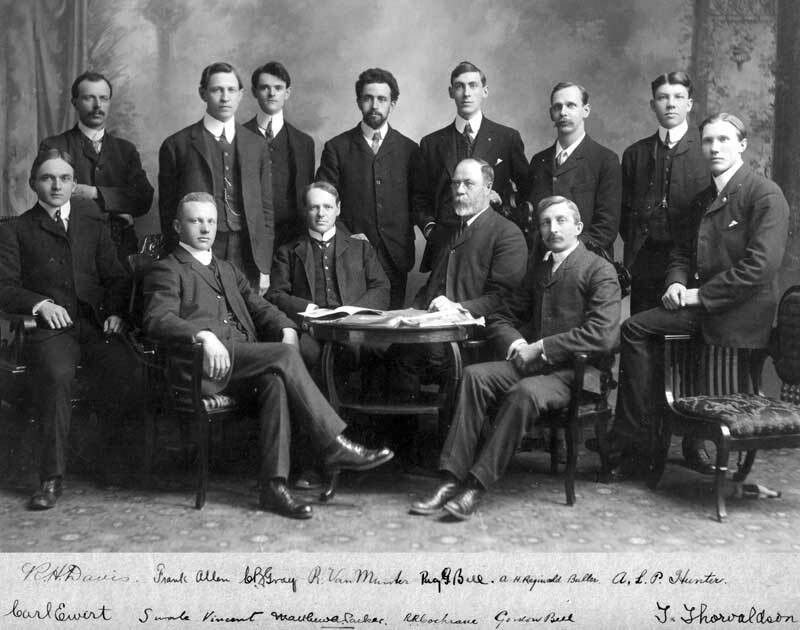 Of 98 members of the British Association giving Winnipeg addresses in 1909, all but three (two of them Bryce and Vincent) had joined in that year. 43. Dr. Frank Fairchild Wesbrook, a former Winnipegger and a graduate of the University of Manitoba (BA 1887, MA 1890), had spoken in Winnipeg on university policy before, in his Opening Address to the Faculty in 1907 [Morton (1957), p. 73], but the occasion of the British Association meeting gave his message a much higher profile. Wesbrook became the founding President of the University of British Columbia in 1913, receiving an honorary L.L.D. from Manitoba in the same year. 44. Manitoba Free Press, 29 & 31 August 1909. 45. Morton (1957) devotes a chapter to this period, pp. 85-107. 46. Morton (1957), p. 95. 47. There is a short sketch of Annie Norrington’s career in the University of Manitoba Alumni Journal for winter, 1967, p. 21. 48. Quoted in Manitoba Free Press, 18 October 1912. 49. The sources for most of the following account are The History of the Scientific Club of Winnipeg 1905-1965 (Winnipeg, 1966), by F. D. White and A. D. Robinson, and the original Minutes of the Club, in the custody of the University of Manitoba Archives. 50. Vincent’s contributions to the Faculty Annual Reports list his research assistants and their publications. Vincent was appointed Secretary of a British Association committee on the physiology of the ductless glands in 1906, a post that was renewed each year, and gave him a research grant that gradually rose to £40, the equivalent of $200 in Canadian money. 51. See Annual Reports of the British Association for the Advancement of Science for these years. No doubt it was because Swale Vincent wanted it that Mrs. W. H. Thompson was a member of his Committee, but the fact that he wanted it shows his respect for her scientific abilities and independence. Vincent’s annual reports on the work of his Committee show that almost all the research was done at Manitoba; Mrs. Thompson’s work was largely on the thyroid and parathyroid glands, including histological and chemical studies. 52. Florence Thompson’s publications are listed in Swale Vincent’s section of the Faculty Annual Reports, and her work as Librarian may be sketchily reconstructed from the University’s early Library records [University of Manitoba Archives, UA9 Box 1 Folder 3]. Florence Thompson died in Winnipeg, aged 50, on 4 August 1915 [Winnipeg Tribune, 5 August 1915, Manitoba Free Press, 6 August 1915; and Province of Manitoba Vital Records]. 53. Murray to Parker, June 23 1937, in Parker Fonds, University of Manitoba Archives, Mss. SC.56, Folder 1. We are grateful to the staff of the University of Manitoba Archives and Special Collections, in particular Lewis St. George Stubbs, for their indefatigable assistance in the research for this article. We also thank Professor Jack Bumsted for reading and commenting on the manuscript.